I love Chinese dumplings and I am sure many of you too. There are hundreds of different kind of Chinese dumplings, from quite small and dainty to golf ball size, so many different methods to wrap, so many different types of pastry and infinite types of fillings. Dumplings can be boiled, steamed, fried or deep fried. And different parts of China have their own different recipes. For the Northerners, dumplings are normally referred to as as Jiaozi 餃子 here are some different types and names. Beijingnese - boiled dumplings 水煮餃子, these dumplings are also the most common in many parts of Northern China. ** If you need further explanation on some of the above dumplings and names let me know. I had posted recipes for wontons and har gau but not any Northern Chinese style jiaozi on this blog. 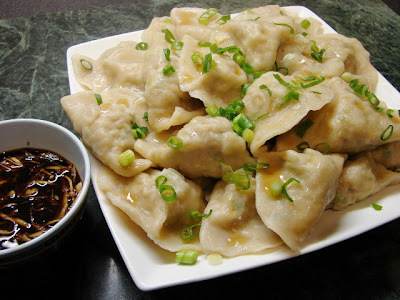 Not to get into too much details with different dumplings, I will continue this post with a simple Northern style jiaozi recipe, with simple wrapping method and a classic filling. The most important tool for making jiaozi is the rolling pin. 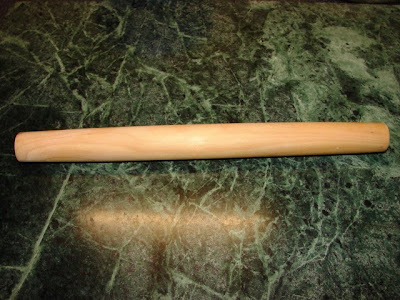 Standard English rolling pin can be a bit too large (thick) for this job, try to get a Chinese jiaozi rolling pin which is about the same width as a bloom stick with both ends a little bit taper. Indian roti rolling pin is also good for this job. I got this rolling pin from London China Town. * you can also use plain flour (all purpose) to make the pastry, bread flour pastry is a little more chewy which I like better. To make the filling, mix Chinese leaf with salt and leave aside for about 15 minutes while you mix the dough, then squeeze the vegetable with both hands to release as much liquid as possible. Discard liquid. Mix all the filling ingredients together. I like to mix with hand by squeezing till everything gel together. To make the dough. Put flour in a mixing bowl. Dissolve salt with water. Pour nearly all the water in, mix to form the dough. Keep mixing, if the dough is really dry add more water bit by bit, till all the dry flour is absorbed into the dough and the mixing bowl is clean. Cover and leave to rest for about 15 - 20 minutes. Then knead till smooth. Cover and rest again for about 5 - 10 minutes. Then cut the dough into half. Roll each piece of dough into a long sausage, dust with a little flour if required, cut the dough into 20 - 25 pieces. Dust the pieces generously with flour, then flatten each piece, set aside. Roll the other piece of dough, cut and flatten. Dust all the pieces with more flour if required to ensure they do not stick later. Take one disc of dough, roll it out very thin. The rolling method is right hand holding and rolling the pin, left hand holding the piece of dough and slowly rotate the it. Put a bit more pressure rolling the edge of the dough. Keep doing the rolling and turning of the dough till you get the right size you want. See slide show. Put some filling on the rolled out pastry, if the inside edge is really dry dab with a touch of water, normally it is not required to wet the edge to seal. Gently fold half the pastry over. Press the edge of the pastry with both thumbs. See slideshow. You need to press very firm to ensure good seal, you may get a thumb print and indentation in the middle of the dumpling. The dumpling is done, simple as that. No fancy pleating or crimping. Dust a tray with flour before you put the dumplings on, also best to lightly coat each dumpling with a little flour too so when you put all together on the tray they will not stick to each other. When you have made all the dumplings you can now cook them. Normal Northerner's style is to boil these dumplings which was what I did. I will show you other methods of cooking with other jiaozi. Boil a large pot of water, when the water is boiling rapidly, continue on high heat, put the dumplings in one by one. Try not to crowd the pan, best cook half first then the rest later. Gently stir the dumplings so they do not stick together. Some dumplings may stick to the bottom of the pan, lift them up gently. Wait till the dumplings all float onto the top and water is rapidly boiling again, the dumplings are now cooked. Take them out with a slotted spoon or a Chinese spider skimmer. Put on serving plate, sprinkle with some spring onion and sesame oil. Sesame oil gives a nice flavour to the dumplings also helps the dumplings from sticking together. Eat these dumplings while hot with the dipping sauce. To make the dipping sauce, either use ginger or garlic as the base flavour, with ginger finely shredded or garlic chopped, mix with a little sugar, salt and black vinegar. If you don't like this vinegar dipping sauce, you can use soy sauce, chilli sauce or chilli oil. Any left over can put in the fridge, when needed fry with a bit oil to golden brown. Hello ! Yesterday, I made this recipe. The result was quite delicious, even if my dexterity left a little to be desired. I would like your thinking concerning the following three questions: (1) you don’t specify if the water to make the pastry is cold or boiling. Irene Kuo uses boiling water while Yan-Kit So uses cold water. Barbara Tropp says to use cold water if making boiled dumplings, but boiling water if making pot-stickers; (2) Tropp uses a food processor to make her dough; and (3) Tropp uses a non-traditional method for making the skins: she rolls out the entire dough to an even thickness of about 2mm and then uses a sharp 9 cm cutter to make the individual disks. She rolls up the scraps and makes more individual disks. Well there are literally thousands of different jiaozi recipes with so many variants. 1. For any of my recipes, if I said water it is always water from the tap or at room temperature, unless I said very cold means ice cold, lukewarm or hot/boiling. 2. Some people use cold water and some use hot water for the pastry. I prefer to use cold tap water for standard jiaozi the dough is softer more flexible and absorbed less water. Hot water dough is stiffer and less stretchy, keeps its shape better. I never bother to take out the food processor for simple dough like this. There is more washing up to do. This dough is so easy, just roughly mix it and leave it for a while and a quick knead it will come together and become a very smooth dough. 3. Traditional way is to roll each small piece of dough one at a time. But if you like to roll a large sheet and cut out later that is fine too. One other question: can I make the dumplings, put them on a tray, keep overnight in the refrigerator and boil or pan-fry the next day? This would make it easier to incorporate them in a meal with other dishes to prepare. Maybe. The filling has to be quite dry (less vegetables) and the pastry needs to be a litter firmer (more flour less water or use hot water dough). You can try it, but I am not too sure. What I normally do when I make a big batch to is boil them first, as soon as they float take them out, leave to cool on one layer. Then keep in fridge. This will keep for 2 - 3 days in the fridge, to eat either just reboil till heated through or fry with a little oil till golden. Hi, I made the dumplings last night and planning to cook them today (dusted alot of flour all over them) but they ended up all stuck and lump together - is there anyway to prevent that? Yes these dumplings will stick together. Cook (boil) them al dente and reheat either by boiling or steaming. The other way is freeze separately on parchment paper then store in bag and use when needed.